April is coming, and with it the torrent of blue lightbulbs and puzzle pieces. For the next month, it will be even more difficult than usual for autistic people to walk around in the world without confronting reminders that we are considered tragic and unwanted by the organizations that claim to speak for us. #WalkInRed is an autistic led initiative to make the world a little less blue this April. 1. On the second day of April, put on a pair of red shoes, socks, a red shirt, skirt, pants, necktie, headband, whatever you have. 2. Post your photo to the #WalkinRed Facebook page or to any page of your own. 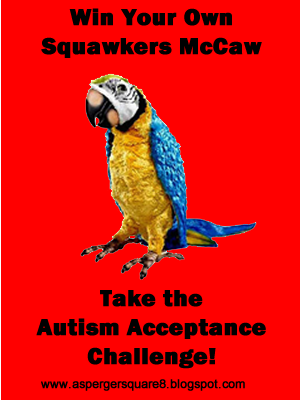 You have now completed part one of the Autism Acceptance Challenge. Thank you for your show of solidarity and/or support. Seeing you out there may give someone a moment of hope or relief on a day that is difficult for many of us. For this challenge, orange is an acceptable alternative to red. No blue, please, except for jeans. Jeans are neutral. These are the rules. If you are reading this, and you still don’t know what’s wrong with blue puzzle pieces and lightbulbs, please read this and this and this and this and this. Visit the WalkInRed website here or follow WalkInRed on twitter. 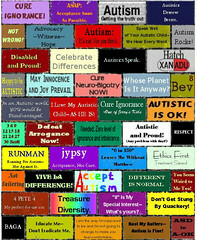 Part 2 of the Autism Acceptance Challenge will be posted April 2. Complete them all to win your own "Squawkers McCaw!" Perla, your links did not work. Want to try again? Or you can send to my email and I will post them for you. Thanks! Thanks, Jack! Don't forget to come back and link to your photo. Not sure if you know this but April is also "Red My Lips" month. To raise awareness to sexual assault victims. People wear red lipstick and red clothing throughout the month. It might be confusing. I did not know that. I didn't start the #WalkInRed initiative (I would have chosen orange), but it is gathering momentum. I hope that the two good causes won't mind sharing a color. The more red this month the better. There is a lot of overlap in these groups as well. That's great to hear. I would suggest that all Anonymous persons give themselves a name of some sort (doesn't have to be related to your real name) if you are participating in the challenge. That's the only way I'll be able to tally up and determine who wins the parrot. Squawk! I will be rocking red on April 2nd for my au-some grandson. Looking forward to seeing your picture! Bev, so happy to have a manner in which to show that I am an ally for people who are #actuallyautistic. Truly enjoyed meeting you at Unconferences in Lexington. I will spread the word! Thanks, Sara! Hope to see you there again this year. That works, thank you, Lisa. Squawk! First entry. Lisa Daniel is in the lead. I am fortunate to be loved by an autistic. One who just by chance chose red today also. Love this photo, thank you, Matt! that's lovely Matt. Hope you and your son are having a great day. My son and daughter are both on the spectrum. Proud to #WalkInRed today. Such a great idea Bev! 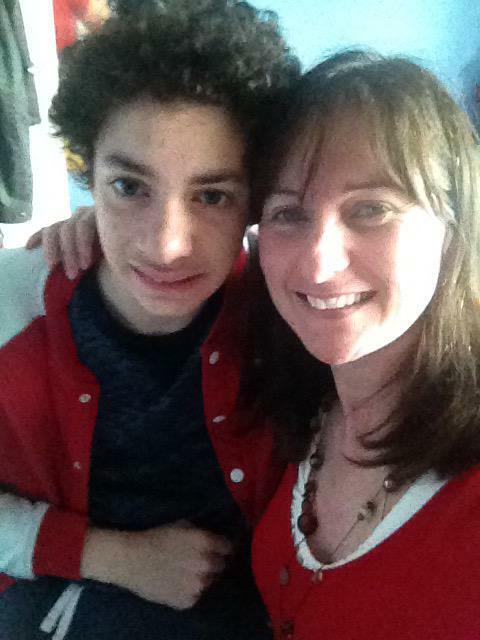 Here's me with my autistic son who is rocking the red! Thanks, Sharon! Happy to see you, your son, and "Henry" here! Hope this one works! If not, please let me know. My Walk In Red Picture. Works fine, Jennifer, and I like those pants! Thanks for participating! Squawk@ Vash the Stampede! Here's a picture of me and my mommy yesterday.